talkhealth > Blog > 2014/04 > Are Food Intolerance Tests Reliable? About ten years ago, I took a YorkTest test on the advice of my then nutritionist. I wasn’t getting any help from my doctor at the time who told me I couldn’t possibly have other allergies! We were struggling to pinpoint which foods were triggering my stomach and skin complaints. They didn’t seem to be reactions like my allergy to nuts and dairy so she suggested an elimination diet, and to compliment this I did the YorkTest basic FirstStep test to see if this might help. I can’t remember now exactly which foods came up, but I know tomato and celery were positives as well as other things including white fish, eggs and wheat. You can imagine the elimination process was hard work, it is strict diet which cuts out all the allergens and other foods the test indicated I had some type of reaction to – such as chicken, lamb, rice and rice milk products etc. When we reintroduced the foods, we discovered that celery and tomato did indeed have a marked effect on my eczema. Some things that did come up in the test are foods I can eat without any problems, but the elimination diet does help you to learn which results were false. The understanding of how to maintain a balanced healthy diet is very important, NEVER start an elimination diet and cut out food groups without this knowledge. Would I recommend the test? It’s not a simple instant cure, but it was an excellent starting point for me to work from. Here is some information about the reliability of food intolerance tests. Food intolerances are becoming an increasingly common condition but are still often mistaken for food allergies. A food allergy is a reaction produced by the body’s immune system when a person comes into contact with a normally harmless substance, and the reaction occurs relatively quickly. Food intolerance, on the other hand, rarely involves the immune system and reactions can take up to 72 hours. There is not one clear symptom that will indicate that you’re suffering from food intolerances as there are plenty of symptoms that might be attributed. Some people have acne, others have stomach cramps or headaches but perhaps one of the most common symptoms is IBS (irritable bowel syndrome). In cases where trigger foods are easy to identify it can be tempting to self-diagnose. However, if you are in pain make sure to visit a doctor first and ensure that your pains can’t be attributed to anything else. An accurate way of identifying if you have a food intolerance is through food intolerance testing and at this current time, this service is not provided on the NHS so it must be obtained privately. A frequently asked question about food intolerance testing is its reliability. Here are a few informative facts about food intolerance testing from food intolerance experts at YorkTest Laboratories. What kind of tests are there and what do the tests do? Food intolerance testing with YorkTest entails a FirstStep test, which is a basic pre-screen for IgG antibody reactions to foods. The test is easy and all it requires is a finger prick blood test which can be carried out at home. You then post back your sample in a pre-paid envelope, it is then analysed by scientists in a state-of-the art laboratory. A positive result will take you to the next stage of expert analysis to discover which specific foods you have an intolerance to. This includes taking part in one of their comprehensive programmes – IBS Diet Programme, Food&DrinkScan Programme and Ideal Weight Programme. All three programmes, offer testing catered to your symptoms and one-on-one consultations with a Nutritional Therapist, ensuring a bespoke service tailoring to your special needs. Who should take the York Test? It is advisable that you speak to your GP first to eliminate any other cause to your symptoms. If you strongly suspect the cause is a food intolerance, it is definitely worth taking the FirstStep test to confirm it. Individuals have attested to seeing results within three weeks of taking nutritional advice and cutting the offending food out of their diet. They have seen great improvement to their wellbeing and fitness, thus helping to improve quality of life. To find out more about food intolerance testing, speak to the experts at YorkTest and see how you as an individual can benefit from it. 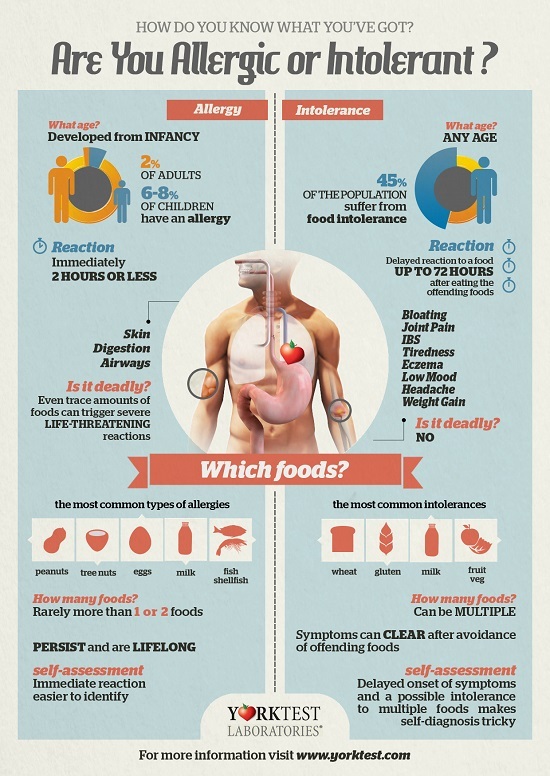 Learn more about food allergy and food intolerance.